This conference seeks to explore experience from the vantage point of these media-informational transformations. We will be debating art practice, cultural theory, media aesthetics, social theory, forensics, urbanism, and the landscape of the political. 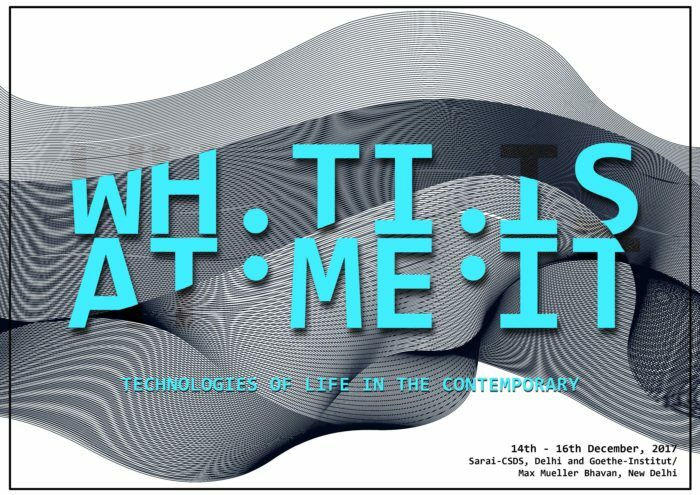 Time horizons and its philosophies are a major concern of the conference, as we seek to displace the idea of the contemporary as (just) a ‘present’ without limits. Sarai-CSDS is a part of the Leverhulme International Network for Contemporary Studies (LINCS). This conference is supported by the Leverhulme Trust and the Goethe-Institut/Max Mueller Bhavan, New Delhi. PDF version of the conference programme is available on this LINK. Sarai is a programme of the Centre for the Study of Developing Societies (CSDS), Delhi. Sarai was initiated by Ravi Sundaram, Ravi Vasudevan, Monica Narula, Jeebesh Bagchi, and Shuddhabrata Sengupta in 2000. Raqs Media Collective is a contemporary arts and curatorial practice based in Delhi. The Leverhulme International Network for Contemporary Studies (LINCS) includes the University of Quebec at Montreal, Glasgow School of Art, University of Paris 8, Sarai-CSDS and University of St Andrews.